Tulum Real Estate – Privileged Location as Airport Opens New Tourism Area. Tulum Real Estate is currently positioned to start moving into a more central role in the state of Quintana Roo, which includes some of the countries strongest points of interest for international tourism and real estate, including Cancun, Playa del Carmen and Cozumel. 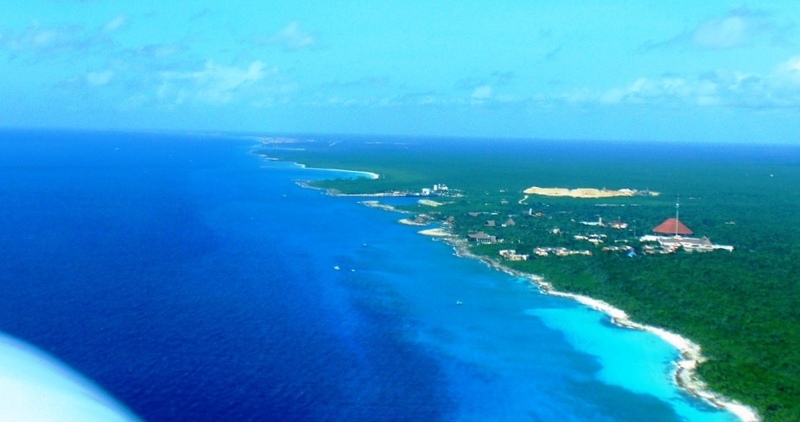 While up until recently Tulum has received less attention than its more established neighbors, recent plans to build an international airport in the Tulum Real Estate area, will begin converting Tulum’s location to a central point for both tourism and real estate, a phenomenon already being realized in developments such as Aldea Zama. The Tulum airport will not only bring more visitors to the Riviera Maya – the stretch between Tulum and Cancun – through Tulum, but will open up the area south of Tulum for tourism. The area includes a number of Mayan ruin sites, and the 19th century city of Chetumal. Tulum, however, is well positioned to grow as a “center” for this expansion, both in the tourism industry, offering one of the most beautiful Mayan pyramid sites, and in real estate, offering a very well developed urban growth plan, and several new top-notch developments. 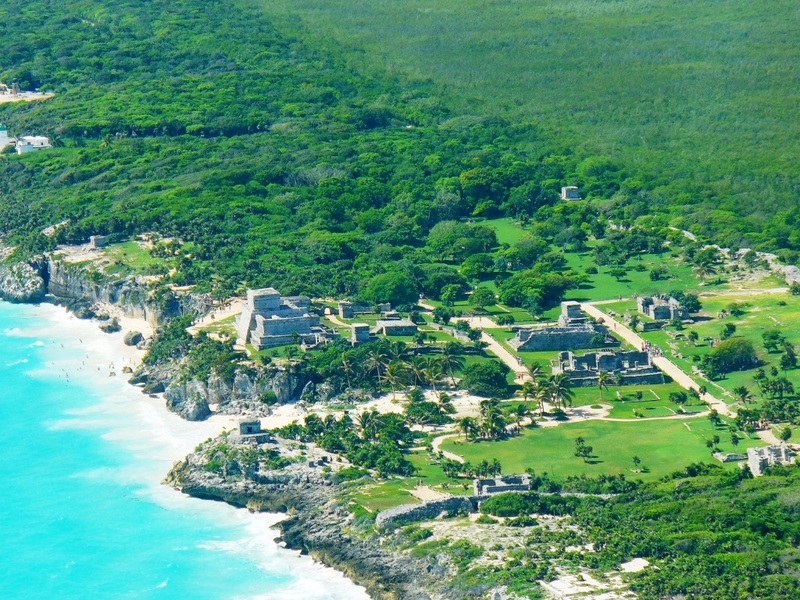 According to a representative of Mexico’s National Institute for Anthropology and History (INAH) the number of visitors to Mayan ruins is currently concentrated in the north of the state (Tulum and northwards), where sites draw nearly 80 percent of the total visitors, mostly due to convenience in access. While the airport will certainly open up new archeological attractions south of Tulum, INAH has put Tulum at the top of the list for Mayan-ruin oriented tourism. Archaeological sites in the state of Quintana Roo (which includes Tulum, Playa del Carmen, Cozumel and Cancun) have received one million 292 thousand tourists this year, of which the majority are foreigners, and who prefer the site at Tulum. pyramid site situated directly on the sea shore; Tulum’s main temple is on a cliff overlooking the Caribbean Sea, with a beautiful beach located almost directly below. At this site, visitors and residents alike can enjoy a breathtaking tour of the pyramids to learn more about Mexico’s rich pre-Hispanic history, and from there take a 2 minute walk down to the beach to enjoy the sun and the ocean. No other location, including the world-famous sites in Yucatan, such as Chichen Itza, offer this ideal combination. Recently Tulum Real Estate has already been gaining a growing amount of attention, especially in the area of land purchases, both for those interested in building their future beachfront home, and for property investors. Among the most attractive Tulum land for sale options is the Aldea Zama development, with its rustic-contemporary village oriented design. Proximity to Downtown Tulum, the beach, MayaZama (a larger scale development with an attractive commercial section on the walk to the beach), and, of course, Tulum’s pyramid site makes Aldea Zama an ideal choice for Tulum land buyers. The privileged status of Tulum’s Mayan pyramids will draw even more attention to Tulum on an international level as a tourist destination, in turn, drawing more attention to international real estate purchases, strengthening investment possibilities, giving an solid base to a strong tourism infrastructure in the area – which is always a benefit to real estate buyers – and bringing an every growing community of North Americans, Europeans and others. CANCUN, México, oct 20 . – El operador de aeropuertos mexicano Asur dijo el martes que duplicó la capacidad de su principal terminal, en el balneario caribeño de Cancún, con la apertura de una segunda pista de aterrizaje que le permitirá atender a 28 millones de pasajeros al año. MEXICO, Octubre. 2.- El presidente de la Bolsa Mexicana de Valores, Luis Téllez, comentó que el programa de Certificados de Capital de Desarrollo (CKD) del australiano Macquaire Bank ya fue aprobado y podría colocarse en breve. Macquaire es un banco de inversión especializado en infraestructura y es uno de los principales interesados en construir y operar el aeropuerto de la Riviera Maya. La pretende colocar unos 15,000 millones de pesos en CKD’s. Riviera Maya New Airport To Cater Southern End of Riviera Maya. ITB (International Invitation to Bid) is awaited by investors as the Airport Project of Riviera Maya is expected to detonate investment, employment and thrust economical activity. Patricia Ortiz Blanco, head of IPAE (Real Estate and Property Institute of Quintana Roo Estate) informed that the State Government has given posession of the lots, located in the Municipality of Tulum, for the project to the Federal Government. Read Full Article. An International Airport for Tulum, Mexico As part of its plans to respond to the growing tourism market in the Riviera Maya, the Mexican Federal government has been backing plans to construct and operate a new international airport in the Tulum area. Oscar de Buen, Undersecretary for Infrastructure for the Communications and Transportation Ministry, explained recently that the new airport will be built to handle the passengers staying all along the Riviera, and that there are also concrete plans to modernize the highway system in that corridor. The location of the airport project, whose existence has been denied on repeated occasions by state and federal authorities, was disclosed by ASA (Airports and Auxiliary Services) will be 65 kilometers (35 miles) from Cozumel Airport and 102 kilometers (55 miles) from the Cancun International Airport. It is to lie just South of the town of Tankah, according to information provided by ASA. Its runway is slated to be 3500 meters (11482 ft) long, and sits on a plot of land area of 1500 hectares (172 acres) purchased by ASA for a reported 18 million dollars. An adjacent buffer area was purchased from ejido lands (http://www.mexicorealestateinvestment.org/investing-in-mexico-check-that-title/0054) (properties owned by a collective group of people living on a determined piece of property as a community) just last May to comply with federal aviation guidelines. The reality of an impending airport for the area has already fueled real estate speculation, and the FOR SALE signs have gone up all over the area. An expected exponential rise in the tourism industry, akin to Cancun and Playa del Carmen, is behind the speculation. Real estate firms from Cancun, Playa del Carmen, and the rest of Mexico are beefing up their presence in the area and selling properties for development in anticipation of the boom. The idea of building and operating an international airport in Tulum has been circulating for years now, but has met with opposition from both environmental groups concerned with the impact on the ecosystem as well as opponents who fear the competition to Cancun’s airport. According to Buen, the airport project for the Riviera Maya is part of an integral national plan to include new airports for the resort area of Puerto Peñasco, Sonora and San Blas, Nayarit hoping to increase national air transport capacity by 50% in the next ten years. A second runway is also being added to the Cancun airport, which should be finished by the third quarter of 2009, requiring over $70 million in new investment, hoping to increase its passenger totals to 25 million yearly.